I’ll be honest. I love the ocean. I think it is a great natural wonder and it’s a pleasure to spend time on the water. However, I’m not a big fan of the beach and I hate to lay in the sun and tan. I had a friend who was a dermatologist who once told me that when your skin begins to turn brown, it’s telling you something: “Get me out of the sun, you idiot!” I have to admit that when I see white people intentionally turning themselves brown, I tend to be a bit critical. I think that if God wanted us in the sun, he wouldn’t have invented trees. Now that I have that off my chest, I realize that being in the sun is beneficial. Exposure to the sun allows us to create vitamin D, an element essential to health. Long before we knew how to milk cows, we naturally made vitamin D as the sun inundated our skin. If there was no other source of vitamin D available, daily exposure to the sun would produce all the vitamin D that we would need. You can’t get your vitamin D sitting under a shade tree. There once was a man named Barlaam, and frankly he was in the shade. He was a clever man, a philosopher, and a Greek. He taught that since God by his nature is invisible and unknowable, anyone who claimed to see God or experience God was either a liar or deceived. If Barlaam is correct, then we might as well stop fasting or praying, and go out for a dinner and a movie. What good would such disciplines do? Orthodoxy would be like Islam: God is unknowable and all we can do is follow the rules given to us by his prophet. Orthodoxy certainly believes that the essence of God is unknowable, unattainable, ineffable, and invisible. However, we can know the unknowable, attain the unattainable, experience the ineffable and see the invisible. How is such a thing possible? St. Gregory Palamas taught that while we cannot hold the Sun itself, or even stand close to it, the Sun is known to us through its energies of heat and light. God acts in the world. He comes to us by the Holy Spirit and by Christ. We can sunbathe in the heat and light of God, which is the Holy Spirit. Near Salonika, you can find a cave in the rocks that was the home of St. Gregory Palamas. Here, he spent 20 years in fasting and prayer and in his Lenten discipline of silence, he experienced the Holy Spirit. Unlike Barlaam, St. Gregory did not come to this conclusion by the use of logic, or by the study of Aristotle. Barlaam stayed in the shade, while St. Gregory developed a very nice spiritual tan. When we fast or pray, it’s easy to lose heart or to grow weary. Perhaps, all of this fasting, prayer, and church attendance is just a lot of useless effort. St. Gregory shows us that our prayer and fasting is not in vain. It the way we sunbathe in the heat of the Holy Spirit. The more we pray and fast, the stronger the heat and the light. The longer we stand in this heat and light of the Spirit, the more we begin to gain that healthy tan of holiness. The nice thing is we will never burn like we can in physical sunlight. 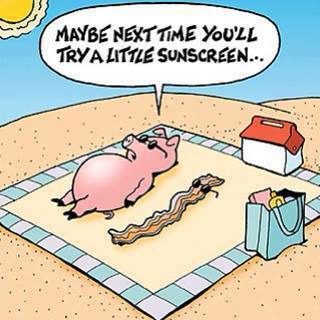 Even better, we never need to use suntan lotion and we won’t get sand in our bathing suits. St. Gregory Palamas, pray to God for us. This entry was posted on March 12, 2009 at 10:08 pm and is filed under Uncategorized. You can follow any responses to this entry through the RSS 2.0 feed. You can leave a response, or trackback from your own site. Interesting analogies. Thanks for your meaningful prose. I wish you would write a nice article about the fruits of the holy spirit.